Enjoy bits and pieces of these frozen desserts in flavours that are tempting, and gathered from all across the globe! Mini Melts in Kukatpally is one kiosk you don't want to miss. Located in the food court of Manjeera Mall in Kukatpally, Mini Melts gets us heart-eyed. Each time we visit, we're excited to try a new flavour. They have various delicious flavours like Oreo Overdose, Candy Floss, Black Currant; but we love their Pop Rocks and Birthday Cake the most. Mint and strawberry flavoured tiny ice cream pops (Think of Magic Pops) that melt in your mouth. 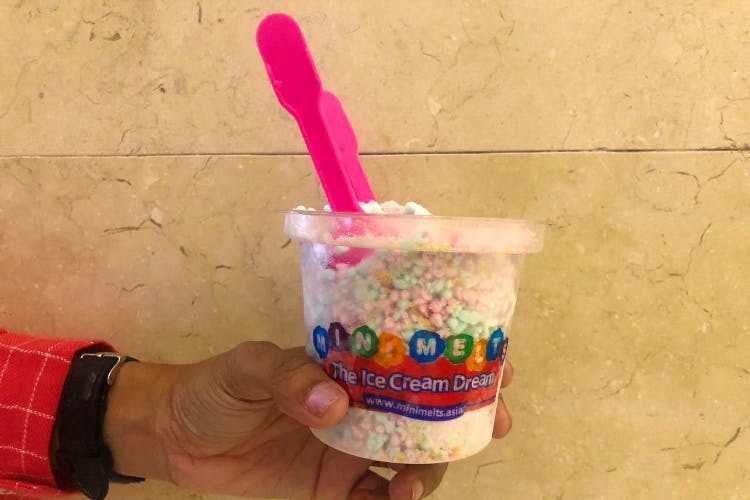 Made by fragmenting ice cream into small pieces and freezing it in liquid nitrogen at -109 degree Celsius, these desserts will get you addicted. So, the next time you're in Kukatpally, don't forget to try these out. However, they also have stalls in Necklace Road and Inorbit Mall, and you are gonna keep visiting them, trust us! The prices are a tad bit expensive at INR 235 for a big cup.